Manifestos are full of points. Pointfulness is their raison d’être. But manifesto advertising feels pretty pointLESS in this day and age. I saw this across the tracks at Green Park. Based on a strong proposition. Based on a point of difference. But it leaves me with an empty feeling, for both creative and strategic reasons. It’s a decent ad, but it’s not a great ad. As soon as you decide to write a rousing manifesto rather than letting a strong, differentiated proposition speak for itself, you also change the reader’s frame of reference. You’re no longer asking to be compared to other ads. You’re no longer even asking to be compared to other, great, long-copy, manifesto ads that have gone before. (A couple of examples included for effect below). You’re asking to be compared to any piece of rousing, stirring, manifesto style writing. So the copywriter needs to ask herself whether she fancies herself going toe to toe with Martin Luther King. The non-deluded and sensible answer will usually be no. Because whilst there are lots of boys and girls out there who can write good ads, those that can write great copy are fewer and further between. I don’t think this is great copy. A manifesto writer isn’t just selling her ideas. She’s selling herself. Whether the words actually are 100% hers or not, they have to sound like they are. These words don’t sound like Three’s. They sound like clever copy. So there’s a manifesto frame of reference that works against, not for, this Three ad. There’s also a media frame of reference that works against it. It has been published in a BIG poster format. This also changes the reader’s frame of reference. No doubt the Three ad read very well as a hand-written rough on the creative team’s wall. It no doubt it read well and looked great as a piece of artwork. But things change when things get BIG. The medium definitely affects the message. The IRN-BRU posters that I worked on what seems like a lifetime ago used to get a giggle at concept stage. But when we published them as billboards they took on another dimension (pun kind of intended). The scale of the medium added a gosh to the giggle. The medium worked for IRN-BRU. I think it works against Three. Running this manifesto at this size says to me that you think it is a big idea full of big thoughts. It begs the question of whether or not I agree. The Three ad just misses the mark for me. Not by much. But a miss is as good as a mile with manifesto ads I’m afraid. Anyway, all that creative stuff is a side show to the main issue with this Three ad, and manifesto ads in general. The main issue relates to strategy. The kind of modern strategy based on actions rather than words. Advertising not as the thing you do, but as the story of things that you have done. Manifestos are based on promises of actions future. Modern advertising (according to John at least) should be the stories of actions past. If Three’s manifesto is based on truth it should be relatively easy for them to tell stories rather than make promises. “The mobile network that was built for the internet” is a compelling proposition if it is supported by evidence rather than claims. Compare and contrast Three with Apple. This was written after not before. After there was plenty of evidence in the public domain to support the hype. The Apple user imagery that we had all seen with our own eyes told us that this was true. Creative people and misfits really did gravitate to Apple products. This is a manifesto based on stories of things that Apple and Apple users had already done. And we all “knew” Steve Jobs. Even if we hadn’t seen him on video, speaking at some product launch or other, we at least knew of him. We knew the name of a human being behind the brand. 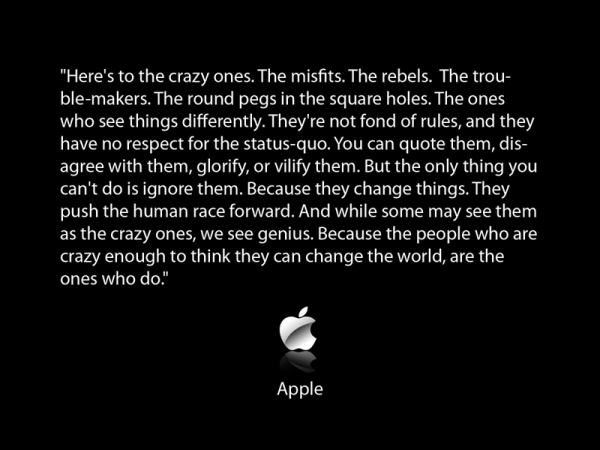 And that makes an Apple manifesto more credible. There was a horse’s mouth behind this ad, we felt, rather than an ad agency. Now compare and contrast Three with Avis. “That’s not fair!” I hear you cry. It’s not fair to compare a Three ad with one of the greatest brand campaigns of all time. This is exactly the kind of comparison begged by any manifesto ad that dares to put its head above the parapet by way of a cross-track poster at Green Park. The people behind the Three manifesto were asking to be weighed and measured against other manifestos. And they’ve been found wanting. Avis advertising comes from another age. But is carries lessons for today. Its conviction and its power to convince comes from its understated, matter of fact tone. Its conviction and its power to convince comes from the fact that important sections are written in the past tense. These are actions not promises. Stories of things done. Make your points in the real world before you make them in your advertising. Then your ads will be pointful rather than pointless. It feels like Three has lots of points to make, but this ad doesn’t make them.